In this blog post we provide data from our testing of the new Rodeostat. 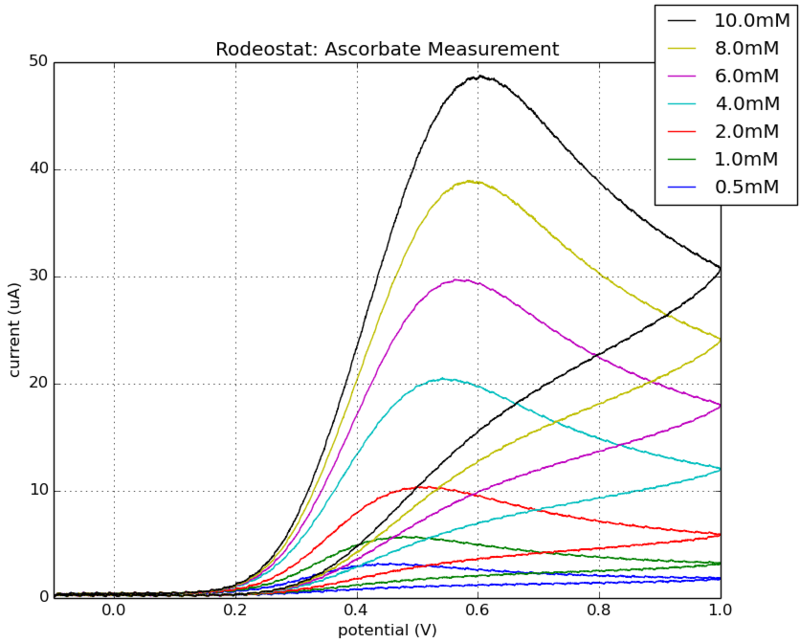 We performed a side-by-side comparison between the Rodeostat and the Cheapstat potentiostat using ascorbate cyclic voltammetry experiments. Ascorbate is a commonly used example of irreversible cyclic voltammetry (CV). This method can be used to determine the concentration of ascorbate in liquids such as orange juice as described in the originial Cheapstat paper by Rowe et al (2011). We have previously posted a method for ascorbate cyclic voltammetry using the Cheapstat and screen printed carbon electrodes here. We repeated this test with a range of ascorbate concentrations (0.5 - 10 mM) with both the new Potentiostat Shield and the Cheapstat potentiostat. A single Pine screen printed carbon electrode was used for all of the measurements along with a screen printed electrode adapter (type A). Data for each ascorbate concentration (0.5 - 10 mM) was collected from the Cheapstat potentiostat and then with the Rodeostat. 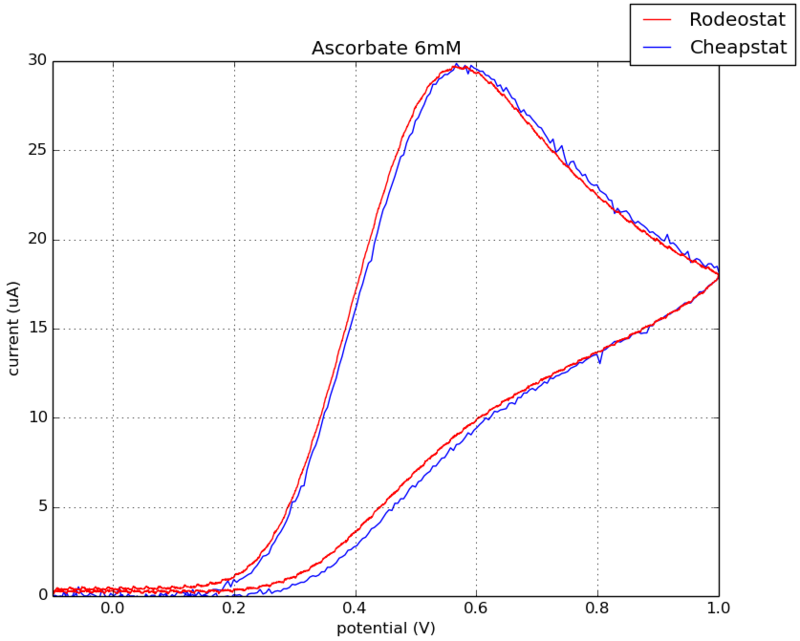 The image below shows a direct comparison between the Rodeostat and the Cheapstat with one of the ascorbate solutions (6 mM). The two voltammagrams and very similar showing that the new Rodeostat potentiostat performs as expected when compared to the Cheapstat potentiostat. There is less background noise in the data collected with the Rodeostat likely due to the higher resolution analog-to-digital converter and precision components. The peak current (uA) was determined for each of the different ascorbate concentrations measured with the Rodeostat and the Cheapstat. 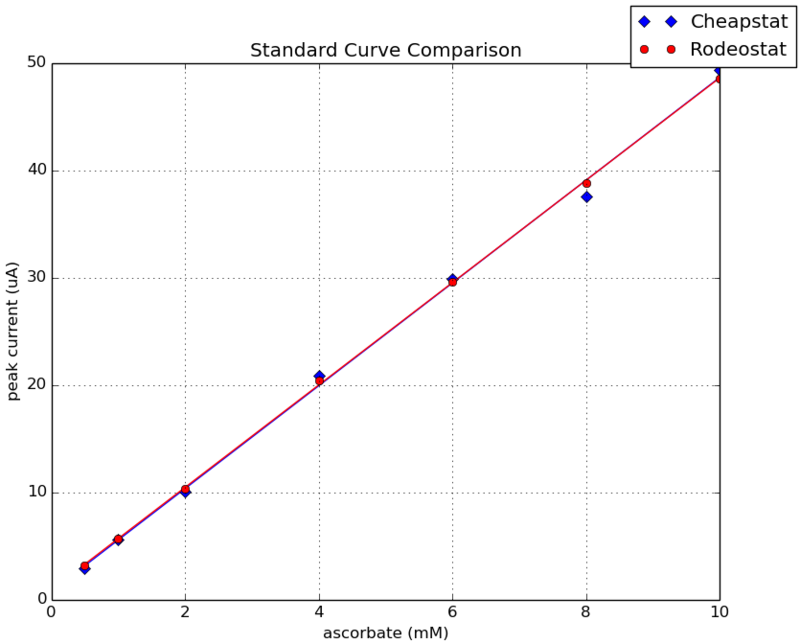 The two standard curves are shown below. As you can see, the standard curves were very similar for the two devices.